The Chocolate Fantasy Factory And The Magical Money Tree - Charley Brady - Opinons. My Own. Politics, Movies, Print Media, Music, H.P. Lovecraft, Graphic Novels, Etc. The following article originally appeared in New York’s ‘Irish Examiner USA’ for March 12 2013. For some bizarre reason and I can’t see it myself— certain readers, in particular my mum, a couple of disgruntled ex-girlfriends and some fundamentalist religious nuts—seem to think that this column is always negative. Why this should be so is extraordinary to me. I have been known to be great fun at parties, breaking into the odd verse of “Edelweiss” on occasion and even cracking a Politically Non- Correct joke or two at times. Of course you always think that you’re great fun at parties when you’re half-cut, but that’s another story. Brendan and Darren of the Olde Brewery in Oranmore would no doubt beg to differ. These same people will probably expect me to start today’s column by some sly or even in-your-face digs at our beloved Taoiseach Enda Kenny and his little pet lackey Eamon Gilmore, he being the leader of what is still laughingly referred to as the Labour Party. After all, both of them did come out with some real self-serving beauties during the week. As for me being negative, not so; and I’ll get back to those two parasites in a moment. This week, though, may I begin by saying how happy out and positive I am today because I’ve been listening to some tracks from the comeback album by the great David Bowie? I turned 54 last week. It’s weird, isn’t it? You go to sleep when you’re 24 years old and the next morning you wake up and find that thirty years have passed. It’s a bit like those mad stories of people who fall into a coma outside an Irish fairy fort and when they emerge into a bright new dawn find that decades have gone by without them even knowing it. Was I this cynical back then? Did I feel as bitter and unforgiving when I was 24 years old? Or did I honestly believe that things could be changed? Was I ever that naive? I suppose I was, really. I suppose that before Life endlessly kicked me in the unmentionables (with a little help, it must be said in honesty, from myself) that at some point I actually believed that we—the abstract ‘we’—were going to be able to make a difference. Ah, Brady, you mad fool! Were you ever that stupid? Were you ever that much of a thick? Well, yes I suppose I was. Maybe we all were. Excepting, of course, the ones who even then were speaking out of both sides of their mouths in order to keep all possible options open. The ones who went on to become the likes of Bertie Ahern or Tony Blair; the ones who perhaps from the very beginning had no great desire to help the people who voted for them but instead to just rip off the system. It doesn’t seem to matter or even be remembered anymore that the likes of Ahern made damned sure to look after his mistress—and himself of course; or the likes of his war criminal buddy Blair embracing the European Court of Human Rights just because his ghastly wife Cherie was in line to make a shed load of loot out of it. Somewhere along the lines all principles were lost, all ideals went down the toilet bowl. But today I remembered a moment when things seemed a lot clearer. For a wonderful little period of time I was transported back and was once more listening to the guy who gave us “The Man Who Sold the World” and “Space Oddity” and “Life on Mars” and “An Occasional Dream” and all the rest of his wonderful back catalogue. Horrifyingly, as I was listening to his new outing I had the occasional flash of the putrid ‘boy bands’ that I’ve heard by accident over the years and found myself muttering “Talentless Little Pillocks” for the umpteenth time. But today I feel so good that I can even wish that abysmal lot well. On condition that they go and listen to an old Master of the Art and learn how it’s done. Welcome back, David; I think we’ve all missed you. “There’s no earthly way of knowing / Which direction we are going/ And no way we can be showing/Where the river can be flowing. “It is raining, it is pouring/There’s a hurricane a-blowing/Not a speck of light is showing/So the danger MUST be growing. “And the fires of Hell are blowing/ And the Grisly Reaper mowing. Wait a minute, that’s not what Eamon, flunkey to Enda said. 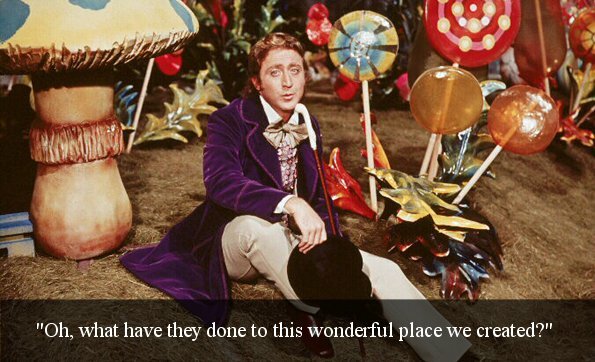 That’s actually from “Willy Wonka and the Chocolate Factory”, isn’t it? It is, these sad days, quite chilling to listen to any of them. They have begun to sound like some cold, bloodless and gloomy tract that only the Dark Ages could have thrown up. And I mean thrown up. They can only speak about what they have done for Ireland, never for the Irish people, never for the flesh-and-blood men and women who make up a country. It’s to Hell with them; it’s about what makes our masters look good in the eyes of THEIR masters in Europe. That’s what it’s all about to them on these dark days. What Enda and Eamon are really talking about is what they have done for themselves. 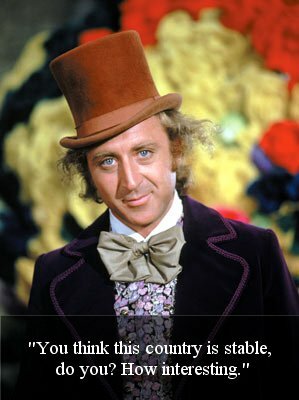 “We have stabilised Ireland”? What about us, Eamon and Enda and the rest of you piranha? Have you forgotten that a country is just a measurable piece of ground but that people are people, with their hopes and aspirations? I suppose that sounds corny to the likes of you and your cronies. Make no mistake about this: our current crop of political hooligans have not even the decency to worry enough, as an ultimately cheap little crook like Charlie Haughey did, or to concern themselves enough, with how history will remember them. This bunch are so shallow and unredeemably rotten that all they care about is the fact that they now have pensions that will last them the rest of their miserable lives. I’m sorry; did you want something a little more objective? Did you want something a little more balanced? Then look elsewhere. I’m too damned close to what they are doing to my friends and to people that I care about. I’m too close to Irish people—not Ireland, not that vague concept that you have turned it into, Kenny and Gilmore–, too close to once-again struggling Irish people that you and all like you have driven to the sink holes of desperation. I’m not in the mood for your platitudes and your smirks as you explain, as did finance Minister Michael Noonan last week that we are “taking one for the team”. What in the name of all that is unholy was he on about? Had he seen one too many Ronald Reagan films back in his schoolteacher days? One for the team, his well-upholstered rump. WE may be taking ‘one for the team’ without even wanting to; but Noonan and his trough-snuffling colleagues as sure as Hell is black at midnight are not. Noonan then spoke down to us as usual by announcing that: “There is no Money Tree in the back garden.” Well, he got that one half right. There’s certainly no money tree in my garden but after last week there is one bloody great big one in his. Still, he did unconsciously use a very apt symbol for men who live in the magical Land of Do-As-You-Please. You can no longer single out one of them because the culture of sheer dishonesty runs through the entire miserable shower. You need only take a random sweep on any given week. Just cast your net and off the top of your head you will come up with the likes of Des Richardson, who back in the day was one of Ahern’s main political fundraisers and now named and shamed—ha! Shame, this lot?—as being a tax defaulter who has just had to cough up €109,000 in a settlement. Or North Tipperary TD Michael Lowry…ah, Lowry. I’m sick to the back teeth of writing about this fella and yet still he hangs on an on. It’s only a month ago in these pages that I was talking about his extraordinary problems with amnesia when it comes to declaring vested interests…and here we go again. Now the guy who used to be a communications minister—how ironic since he keeps forgetting to communicate just how much he’s worth—has had to add even more forgotten shares in land and bloodstock to the Dail Register. You know, I mightn’t be the best myself at remembering where I left my empty wallet after a night on the tiles; but I’m pretty sure that even an idiot like me would remember if I owned acres of land or shares galore. Day in and day out we let them get away with it. And as of last Saturday 9th of March they have their pensions secured. And all that they had to do was to stick out two years in Government. All that they had to do was to sell their fellow Irishmen and women down the river in the name of ‘austerity’. All that they had to do was add tax after tax, whilst desperately trying to come up with new names for that. All that they had to do was grind us into the ground to the extent where we were too weak and cowardly and browbeaten to ever get up again. All that they had to do was break the spirit of a people and not give a damn about the consequences in suicide rates and sheer unadulterated despair. As I said before: at least even Haughey had some sense of his role in history, no matter how contemptible it might have been. But this lot? It would be laughable if it weren’t so damned pitiable. Because they are now such experts, why don’t we have one more fund-raiser to cover the expense of sending them over to Cyprus. But, one way tickets only! Now that Cyprus has stood up for itself we can see even more clearly the shoddy job out gang of crawlers did for us, not that they even gave us a say. Cyprus was told to hit bondholders whilst we were ordered not to. I’m beginning to wonder if Cyprus hasn’t just been a social experiment by the Euro-thugs to see how much they could get away with. If they had pulled that in Ireland you can bet your life that we would have rolled over. Agreed, and, as far as I know, unlike us, the Cypriots are still masters of their own oil resources.